First day of Fall. What? Its 28°C! Back in May, the little one called to ask if I could make some couch quilts for two of her best friends who were getting married this fall. How can a mother say no, right? Well, then the calls started. I shopped for fabric, had a plan in my brain, easy peasy. So I send along some photos of the fabric I picked and explained my plan. It turns out, I like "old lady fabric" and my pieces are to little. After months of back and forth, more trips to the quilt shop and research, I have two lap quilts ready for delivery when we arrive in the Uk. Talk about being pushed out of your comfort zone. Next time I think I will just get them to buy a vase! It just so happens that taking off for two weeks at the start of October puts a real strain on your schedule. When I get back, I am out and about teaching for the next 4 week. I have been busy getting everything in order for my workshops and checking things off my "to do" list. One of those things is a commission quilt that I have been working on the last few months. All done and delivered. This fall, I gave Quilting by the River a facelift. I have a new logo (Thank you Chantal) and will have the launch of my pattern line when I return. The quilters who will be at the November Workshop will be the first to make "Catch a Falling Star". May I add a big Thank you to everyone who registered early so that I could fly away stress free. The workshop is full and I am ready to rock when I get back. I have also brought in a few new notions that I am hoping you will love as much a I do. You will just have to wait till I get back to see for yourself. The ladies here at the studio are well on their way to quilting up a storm while I am gone. Some are finishing up projects that were not touched all summer. Others have brought in their finished quilts that were done while it rained. This is Anne's block sampler. Over the past few years, I have been teaching the ladies how to "Grid" a block and use the Tucker tools to make their units. Anne wanted to see if she had absorbed my teachings and put together this sampler. Fantastic! Its getting on and I have a quilt to long arm before I leave in a few days, so I had better get at it. Thanks for dropping by. Until next time, stay safe, enjoy the weather and find your favourite sweater. Hello Friends. I am noticing the leaves changing colour on the trees and slowly making a quilt on the ground below. I have had a few hours here and there this past month to do some fall decorating. I purchased some pumpkins, a few mums and a small bail of straw. So I’m hoping that we have a few weeks to enjoy these beautiful seasonal flowers before all the plants get hit by frost. With the nights turning colder, the mornings have been great for small outdoor discoveries. A few weeks ago, the sunlight, dew and temperature all synced so that the spider webs in the trees glistened like veils of silk in the morning light. I couldn’t believe how many there were in the trees. Mother Nature is decorating for Halloween! Shortly after the long weekend in September, I embarked on one last summer adventure. The three of us sisters, along with my nephew and eldest daughter, portaged into Great Mountain Lake in the interior of Killarney Park. When I was growing up, my family had a cabin on the lake on the point just across from Great Mountain. With the expansion of the Killarney Park boundary in the early 1990’s, the cabin and the sauna had to be taken down. Although the building are gone, the memories of many summer holidays are still vivid in our hearts and minds. I have not done any extensive portaging in years, so my muscle memory was not so vivid. I am still feeling the miles of paddling and weight of the pack my back weeks later. Massage anyone! I haven’t just been gallivanting. I was able to finish the top to my “miniature”. Also, I have the last two table runners done for the November workshop. The studio has been buzzing with the quilters returning for regular classes. The Tuffet class has been a big hit. Just have a look at how cute Deb and Marilyn’s tuffets turned out. Way to go ladies! If you’d like to make a tuffet of your own you can get in touch with me for the particulars. I took a break from packing on Saturday to attend the Northshore Pins and Needles Quilters and Stitchery Guild Quilt Show in Espanola. I love quilt shows! It is just so inspiring to see how every quilter puts a little of themselves in each of the quilts. Even though some of the quilts were the same in construction, each quilt appeared different with their individual colour choice and placement of value. All were beautiful and the hard work and love that went into the show was evident. 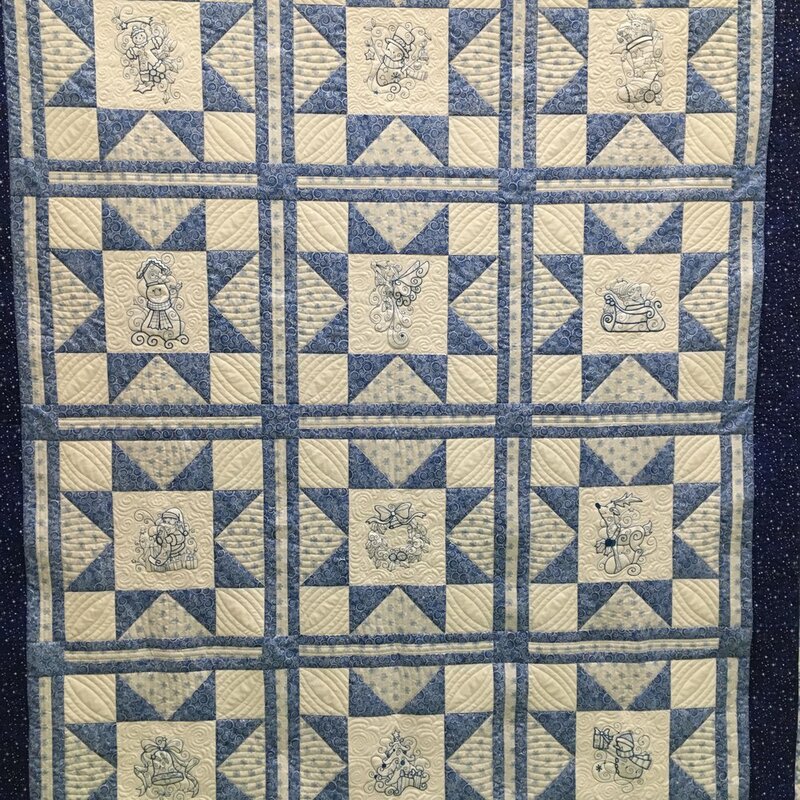 Here are some random pictures of some of the quilts that were on display. That’s all for now as I’m going to give the house a quick lick and a splash before I leave for my visit. Thanks for dropping by, stay safe, rake some leaves and maybe start a new quilt project.